I love how this look came together. I have a "top 5" favorite clothes to shop and one of them are high waisted wide-leg denim/pants. I may not have the perfect torso but no one can stop me from buying high-waisted pieces. Haha I scored this wide-leg overalls at work (I do retail... so yeah). Ladies, have you ever had moments where you went shopping, saw something really pretty but you weren't sure if it will look good on you? Went home restless because you can't get it out of your mind? Then end up going back to the store and bought it?This piece is "it" for me. I thought it was so pretty, classy and the wide leg part is a plus. It's not hard to find a top that goes along with it. A basic shirt, a tank top, or even pieces like what I chose to wear. Polka dot long sleeve top. 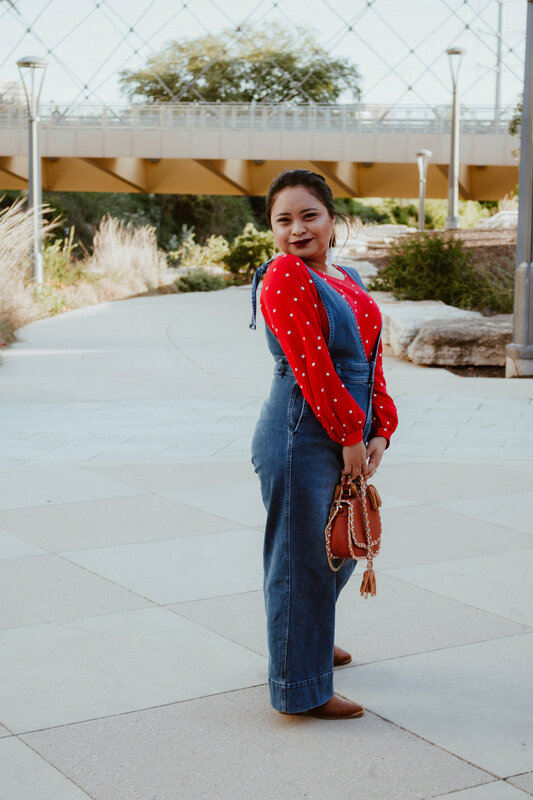 I thought it was a perfect color and pattern to make the overalls pop.